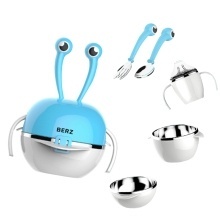 Practical and child-friendly dishes for boys and girls, include plate, bowl, sippy cup, fork, spoon all your kids needs. 2 types spoon and fork for your choice. Easy-grip one for 6-24 months baby, another for 1-7 years kids. Plate, Bowl, Sippy cup, Fork, Spoon 5 in one, stack-up design for convenient to storage and carry on the go. Premium quality stainless steel, no rust no lead and free from harmful substances, vacuum reduce heat loss, food stay warm longer. Food grade break-resistant PP material, smooth edge no worry about any cut. Easy grip fork and spoon, perfect for toddler learn to eat on their own. Sippy bottle and cup easy transition. Cute cartoon appearance, various color for your choice. Ideal gift for birthday, baby shower, Christmas or the young parents. Not available in microwave ovens and dish washer.